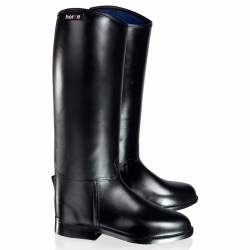 High quality rubber boots with a mock leather look for children. These 100% waterproof boots are flexible down to -40 degrees C without cracking. With performance enhanced lining that absorbs perspiration and moisture, sure grip, and a hard-wearing sole, you'll have a reliable and comfortable fit.